The RiverPark Board of Directors is a group of directors that works very hard for the continued betterment of the resident’s quality of life. Recently, the board partnered with their water district (LID#10) for the funding of the reconstruction of just over two miles of brick walls surrounding and within the community. This project would have cost the community about 3 million dollars if they funded it themselves, but they were able to get the water district to fund 100% of the project and it was completed this year. But wait…..the fun and improvements don’t stop there! 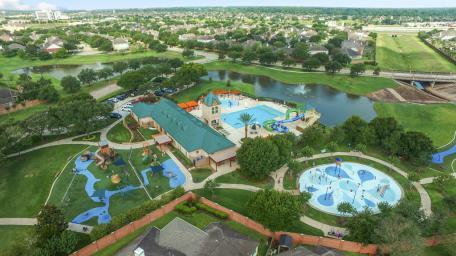 In 2014, under the direction of Dr. Richard Murray, Director of the Survey Research Institute at the University of Houston, the board surveyed the entire community to determine what amenities the owners wanted to see added or upgraded in the future. The board then worked with an engineering firm to come up with the Parks and Open Space Master Plan which was recently adopted by the board. The purpose of the Master Plan is to help increase home values in the community as well as meet the needs of current and future residents by improving the community’s unique parks and recreation assets. This resident-driven plan establishes a clear direction to guide this board and all future boards in their efforts to enhance the facilities. The Master Plan calls for adding a multi-purpose sport court, major revisions to the pool area and a tennis facility. Originally, the plan also included a dog park alongside the sport court area. However, the dog park was pulled out of the Master Plan as the Association found a partner to assist in the funding of this project! Since the dog park would be open to the public, the Association applied for a matching funds grant from the City of Sugar Land’s 4B Corporation. The agreement was signed in August and the Association will receive a grant of $75,000.00 towards the construction of the dog park. This project is scheduled to break ground early 2016. The Association successfully conducted a vote of the membership for approval to enter into a 1.2 million dollar short term bank loan to immediately fund the Master Plan. With the funds via a loan available for immediate funding, the Associaon will be able to complete the project over the course of one year veruses in phases over several years. As you can see, RiverPark is very pro-active and hands on when it comes to making their community one of the best and most desired communities in the Houston area.